How astrology can help Prince William and Kate! 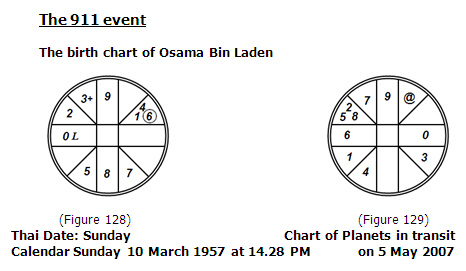 Why the birth time that we used for Osama Bin Laden was wrong! 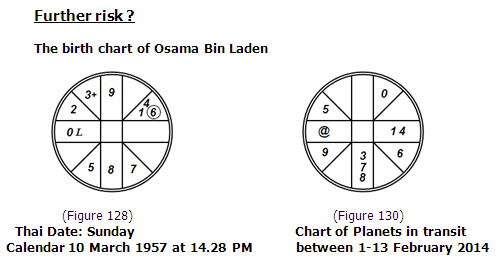 What is correct birth time of Osama Bin Laden? The tragic 911 event occurs at age 45. Between the ages of 41 and 46, the 1st (Self) House in transit, @, is in Pisces. In relation to @ in Pisces, the Ruler of the 1st (Self) House is Jupiter (5). Therefore, while @ is in Pisces, Jupiter (5) represents self. In the birth chart, Jupiter (5) is in Virgo in Insecure position. Self in Insecure position indicates unusual or improper thoughts while @ is in Pisces. In relation to @ in Pisces, the 12th (Loss) House is Aquarius. Its Co-Ruler is Saturn (7). Therefore, while @ is in Pisces, Saturn (7) represents loss. In the birth chart, Saturn (7) is in Scorpio, which is the 9th (Exaltation) House from @. The planet of loss, secret plots interferes with the House of morality. In relation to @ in Pisces, the 6th (Enemy) House is Leo. Its Ruler is the Sun (1). Therefore, while @ is in Pisces, the Sun (1) represents enemy. In the birth chart, the Sun (1) is in Aquarius, which is the 12th (Loss) House from @. The planet of enemy is trapped in the House of loss. The three indications in the birth chart show a strong chance of his plot succeeding while @ is in Pisces. In the transit chart, Jupiter (5) is in Gemini, the fourth House from @, and in the Special Position of Success for people with Lagna in Pisces, an Aquatic sign. It indicates success. Jupiter (5) is also with Rahu (8), the Ruler of Aquarius, and the House of secret plots. In relation to @ in Pisces, the 12th (Loss) House is Aquarius. Its Co-Ruler is Saturn (7) which transits into Taurus, the 11th (Luck) House from Lagna. The planet representing loss and secret plot is in the House of luck. In relation to @ in Pisces, the 9th (Exaltation) House is Scorpio. Its Ruler is Mars (3) which transits into Sagittarius, the 6th (Enemy) House from Lagna. The planet representing morality and goodness is captured in the House of enemy. We sincerely hope that there is nothing like 911 ever again. However, we think it is best to be on guard and beware of any possible risk. The person with Mars (3) as Tanu-set does not give up easily. We see a planet pattern that can be considered as a risk in 2014. In that year his age is 57. Between the ages of 57 and 62, the 1st (Self) House in transit, @, is in Cancer. While @ is in Cancer, Jupiter (5) in the birth chart is in Insecure position. While @ is in Cancer, the 6th (Enemy) House is Sagittarius whose Ruler is Jupiter (5). Therefore Jupiter (5) represents enemy. Having his enemy weak in Insecure position is the first indication. In the transit chart, Jupiter (5), the planet of enemy, is in Gemini, the 12th (Loss) House from Lagna. The enemy is further weakened in the House of loss. Finally, in the transit chart, there are Mars (3), Saturn (7) and Rahu (8) in Libra. All three planets are in the Special Position of Plenty, indicating exceptional chances of success. In relation to @ in Cancer, Mars (3) is also the Ruler of Aires, the 10th (Career) House. The planet representing work is especially strong between 1 - 13 February 2014. This is the one event that we hope will not happen, but it is better to be forewarned. Why we missed Prince William's marriage Why the birth time that we used for Osama Bin L..
© Copyright 2009-2014 KnowYourFutureThewebsite.com All rights reserved.